Astoria, Queens rules – In today’s post. 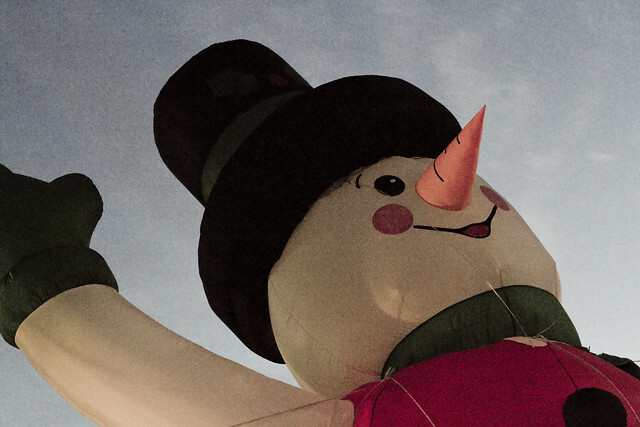 Wandering about in the dark and cold, as one is wont to do, this inflatable snowman was encountered on Northern Blvd. at the angle between Astoria and Sunnyside. For those of you who don’t “speak Mitch,” an angle is the borderland between two neighborhoods where you’re neither here nor there. These “angles” are usually where the old municipal borders between the town and villages of Western Queens were found – prior to the creation of Long Island City in 1870, or the consolidation of the greater city in 1898. These angles are where Robert Moses would usually site his roads, as is the case with the border between Sunnyside and Blissville or Woodside and Maspeth where the LIE was built, or between Long Island City and Maspeth when the BQE was routed. I’ve always ascribed this to Robert Moses having been clever enough to play the politicians of both communities off of each other, which got him better deals and concessions from each. These ward bosses and assemblymen and town Mayors could then report back to their constituents that not only didn’t they allow Moses to dig a trench through the center of their town but that Old Man Moses had promised them that building jobs would be available for anyone that the elected official put forward. That’s how you build a city! 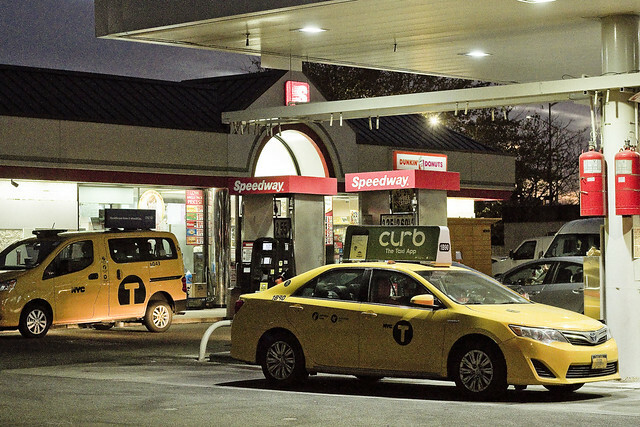 Also spotted while picking my lonely way through the nighted devastations was this pair of taxis gassing up before starting (or ending, perhaps) their shifts. Urban ephemera is what I’m all about these days – gas stations, car washes, minor bridges. Longtime readers of this – your Newtown Pentacle – might remember that there was an electrical transformer fire on my corner back in July of 2016, which was described in this post. 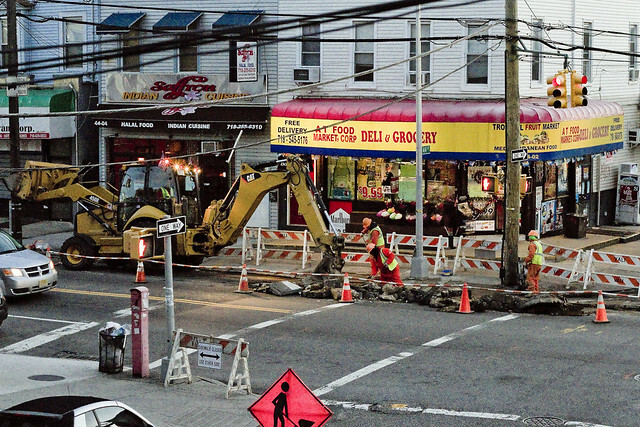 This set off a whole slew of work by Con Ed and its contractors here in Astoria, some of which is discussed in this post. During the intervening months since the event, multiple crews of workers have randomly shown up on the corner, then dug a new trench down into the street, did some sort of stuff, and then filled in their new hole. Two to three random weeks later, another bunch of guys in orange vests shows up and then they repeat the process. The latest passel of work involves the replacement of a lamp post, which must have been shorted out during the transformer fire. Pictured above is a crew who have dug the most recent trench, this time going from the transformer to the affected lamp pole. Unfortunately, despite the fact that the lamp pole now seems to have power, the newly installed LED luminaire mounted on the pole is displaying a red bar rather bright bluish white light. The red bar is the “trouble” signal that repairs are needed, I’m told.